This wall plaque is an attractive addition inside an office or ion a wall or door outside. Other good colors for this plaque are black, gold and white; forest green , gold and white; and gray-blue, gold and white. . 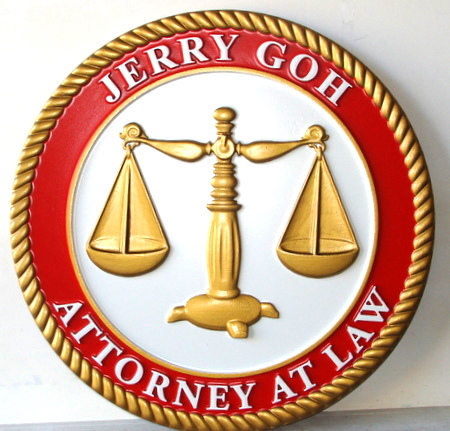 This HDU wall plaque has V-cut letters and a 3- D applique (Scales of justice), all carved with CNC router. Gold can be metallic gold paint or gold-leaf gilded (higher price), Plaque can be any size from 24 in to 60 inches..